Beavers (Castor canadensis) are the largest rodents in North America. Their range includes most of North America, from the northern parts of Canada and Alaska to northern Mexico. Beavers are aquatic rodents which live in rivers, streams, ponds, lakes or other wetland areas. In Indiana, beavers are not uncommon to find in urban and suburban areas. 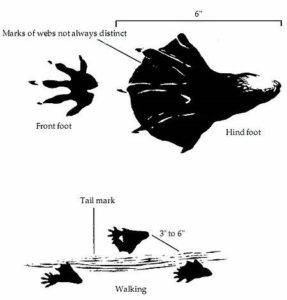 Beavers live in “lodges” built at the water’s edge or farther out in the water (see Fig. 1). They usually enter and leave the lodge through an underwater entrance. However, not all beavers construct and live in traditional stick lodges. In some places, beavers will dig burrows in the steep banks along rivers, streams, lakes or ponds. Beavers use established trails when traveling to and from feeding areas. They usually swim in the same places along the pond bottom. These underwater paths soon develop into depressed or grooved areas called “runs,” and are about a foot in width. Beavers also crawl in and out of the water at the same places, and after a period of time these areas develop into “slides” or smooth places at the water’s edge. The presence of runs and slides is a sure sign that beavers inhabit an area. Beavers feed on a variety of vegetation, but the cambium layer of “soft wood” trees is their principal diet. During the winter, beavers depend heavily on trees such as willow, cottonwood, sweetgum, pine, and most nut and fruit trees. During the summer and fall beavers eat corn and herbaceous aquatic plants, feeding on the basal portion of semi-aquatic grasses, sedges, cattails, water lilies and trees. Beavers increase their tree cutting during the fall as they build up their caches of food for the winter months. Fig. 1. Cross section of a beaver lodge. Beaver dams stabilize creek flow, slow runoff and create ponds which benefit fish, furbearing animals and other wildlife. 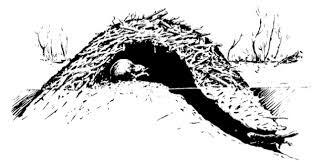 However, when a beaver’s modification of the environment comes in conflict with man’s objectives, the results may be more damaging than beneficial. Historically, beaver pelts from the northern and central parts of the United States were used extensively in the manufacture of hats, and ladies’ coats and as a trimming for other fur or cloth coats. Most of the damage caused by beavers is the result of bank burrowing, dam building, tree cutting or flooding. Levees or pond dams weakened by beaver burrows may collapse during periods of high water. If creeks, drainage ditches, culverts and spillways become blocked by beaver dams, adjacent pasture land, timberland and roadways can be damaged by flooding and erosion. Beavers frequently plug pond risers with vegetation and cause localized flooding. Average 40 to 45 pounds. Uniform dark brown with lighter underparts. Large, flat and furred at the base. One to four kits, average two to three. Single litter usually born in April, May or June; some females may produce a second litter in August or September. 10 years in the wild; 21 years in captivity. Established beaver colonies generally consist of four to ten related beavers. 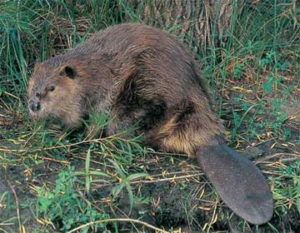 Young beavers are commonly dispersed from the colony shortly after they become sexually mature, at about 2 years of age. Beaver control is best accomplished as soon as there is evidence of beaver damage. Once beaver colonies become established over a large area, controlling them can be difficult and costly. Fencing of culverts, drain pipes or other structures can sometimes prevent damage; however, beavers often simply incorporate the fence into their dam. Fencing lakes and ponds to exclude beavers is generally not practical. Barriers of sheet metal, chainlink fence, or hardware cloth placed around the bases of valuable trees may help prevent damage. The barrier should extend from ground level to a height of about 4 feet. The Clemson pond leveler (perforated pipe encased with heavy duty wire) or a T-shaped pipe can be introduced into the beaver dam for the purpose of water management. This will allow water to continue to flow and prevents beavers from repairing the dam. For information on constructing a pond leveler, contact the Wildlife Conflicts Information Hotline (1-800-893-4116). A variety of traps and trapping methods is effective in controlling beavers. Live traps, leghold traps, conibear traps and snares can be used. The effectiveness of any trap is determined by a person’s knowledge of beaver habits, as well as proper trap selection and placement. Trapping and removal of beavers is a difficult and complex task often best left to professionals. Check the this web site for a list of professional nuisance wildlife control operators in your area. At the present time there are no toxicants, fumigants or repellents registered for the control of beavers. Beavers are classified as furbearers in Indiana. Other furbearers include opossum, mink, skunk, weasel, raccoon, muskrat, fox, and coyote. Under state law, a landowner or tenant may take furbearing animals at any time on their own land if they are causing damage. Beavers can also be taken during the legal trapping season with a trapping license. The beaver must be euthanized or released in the county of capture. Homeowners who have trapped and relocated/euthanized a beaver must report it to IDNR within 72 hours of capturing or euthanizing the animal. Permission from the property owner must be obtained prior to releasing an animal on their property. Individuals with nuisance wild animal control permits can assist homeowners with nuisance beavers. The names of licensed nuisance wild animal control operators and additional information can be obtained from the Indiana Wildlife Conflicts Information Hotline at 1-800-893-4116.